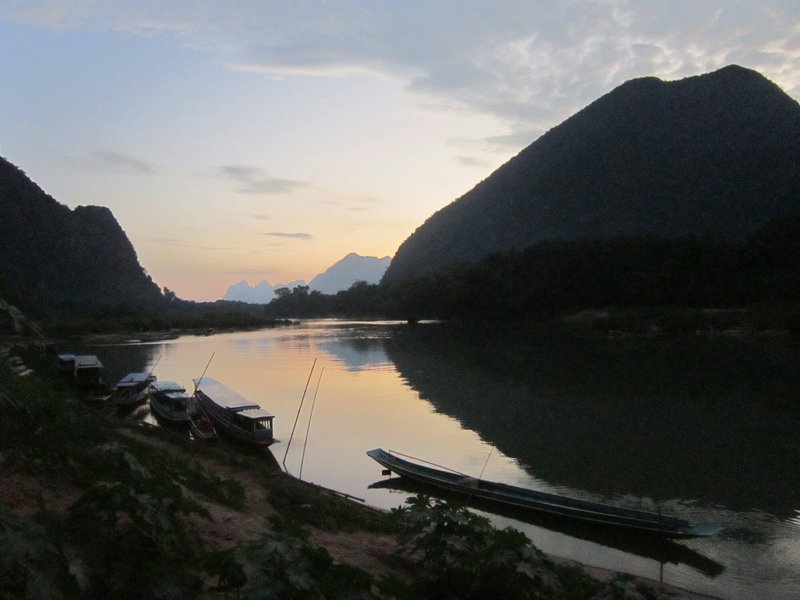 Time to head north in Laos and go trekking! Of the Henry group, 7 of us went north, and we said farewell to John who headed for further adventures. First off a 4 hour very bumpy mini van ride to Nong Khiaw, where we grabbed some food then chartered a boat for the hour journey to Muang Ngoi where we stayed the night. 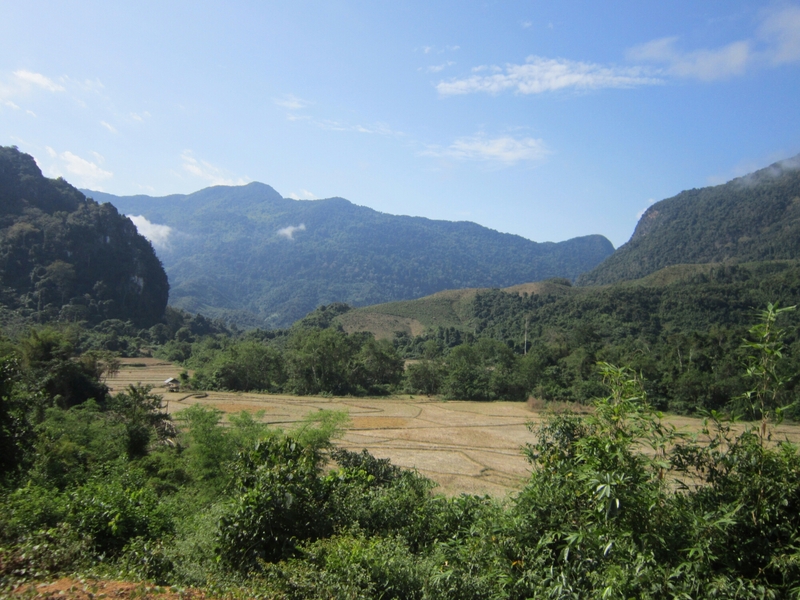 The scenery in this part of Laos is spectacular, mountains, river and jungle! Right by our accommodation there was a mini beach and walking a long a bit further from the (minimal) light of the village and the amount of stars in the sky doubled, it was beautiful. There was a couple people with a small figure on the beach so we joined them to chat for a little bit. Muang Ngoi itself is pretty small, a few places to stay and eat, all in all quite pleasant and a nice change after my previous destinations on this trip. We set off the next day with 2 guides. The one who could speak English was named Kao (spelling?) though I don’t know the others name. Unfortunately Chris got sick so had to take it easy and couldn’t join us on the trek. The trekking was tough but enjoyable. 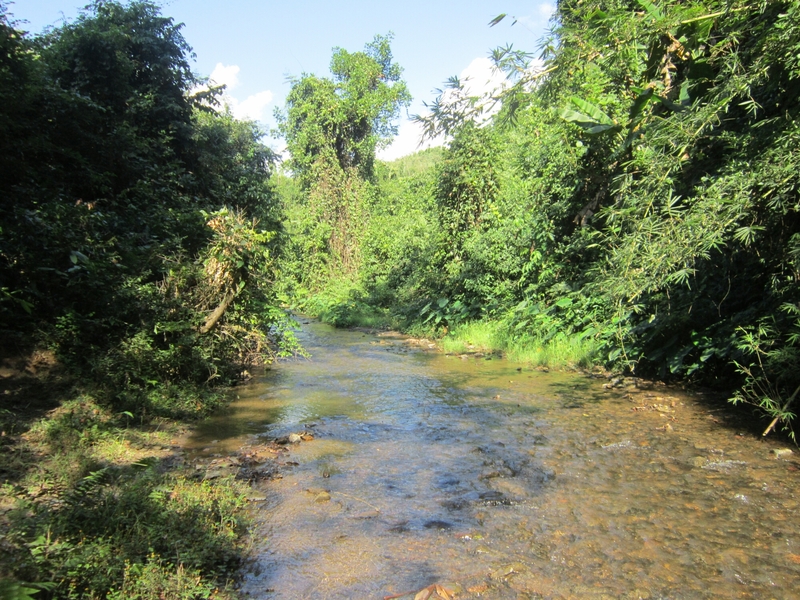 We crossed rice paddy fields, several rivers/streams (got leeched once but had to fight off several more) and head upwards through the jungle. 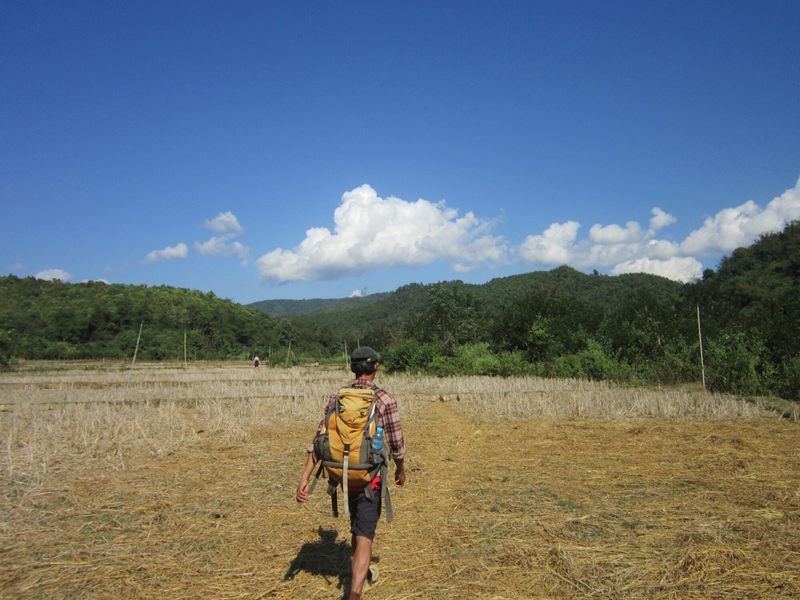 We were also joined on and off by a dog that followed us from Muang Ngoi! We called him Henry of course! 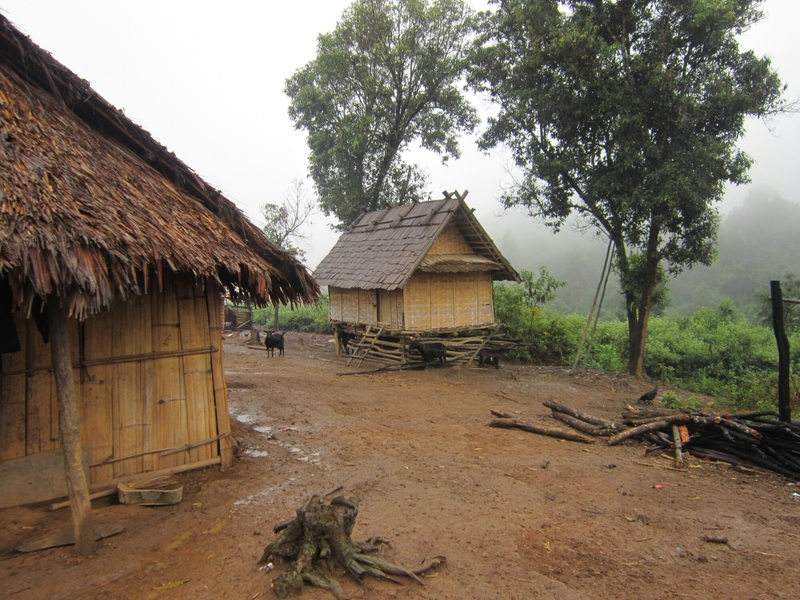 Our destination for day one was a hill tribe where we spent the night. 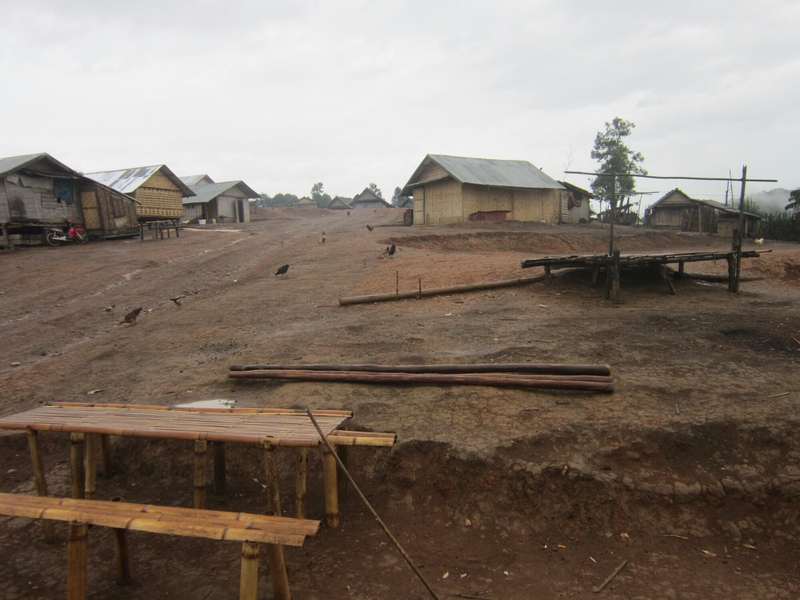 The village was a mixture of 2 peoples, though unfortunately I can’t remember which exactly or even the villages name! The population was I think 266 but actually increased by one whilst we were there as a baby was born shortly after our arrival! There was one tap which was maybe 200 meters away from the settlement and no toilet…. in fact the pigs (of which there were many) followed you to the bushes when you were going to the toilet….you can probably guess why!! The village had many chickens, goats and dogs as well as the pigs. It was nice to see Henry the dog join us there too! 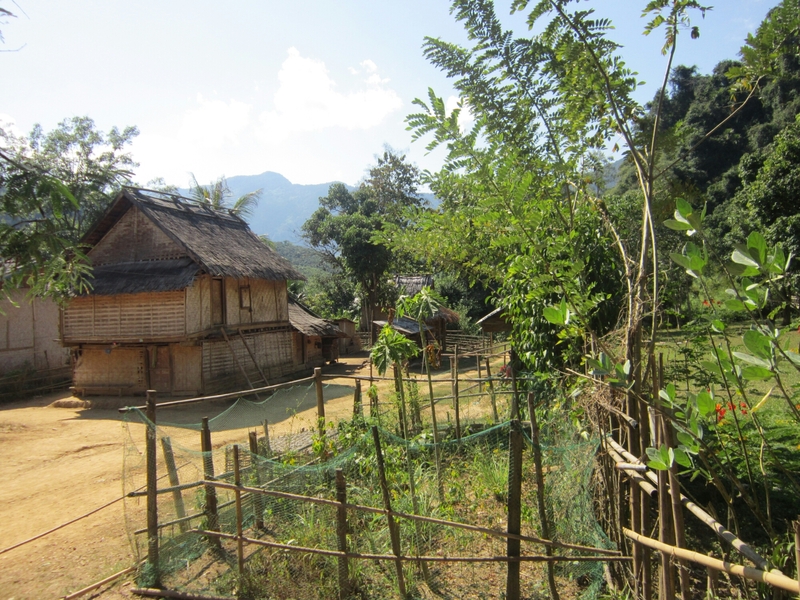 We stayed in the home of some of the villagers, it was great as they cooked for us, a meal of sticky rice and friend bamboo and friend vegetable and also pumpkin soup. After the meal a guy from the house sat with us and Kao and we drank a few shots of Lao Lao which is home brewed whisky. The guy was 26 and already had 6 children!! 2 of which sat with us whilst he poured the lao lao from a plastic bag into a bottle, before using a single glass to give us the shots. The 6 of us slept in a row, we had 4 mattresses and also blankets and pillows, it was pretty cosy! We actually went to bed at 19:30 which was kinda odd but in fit with village life. After all the sound of all the animals and children makes it hard to sleep early the next morning anyhow! After breakfast and a shot of Lao Lao it was time to set off. 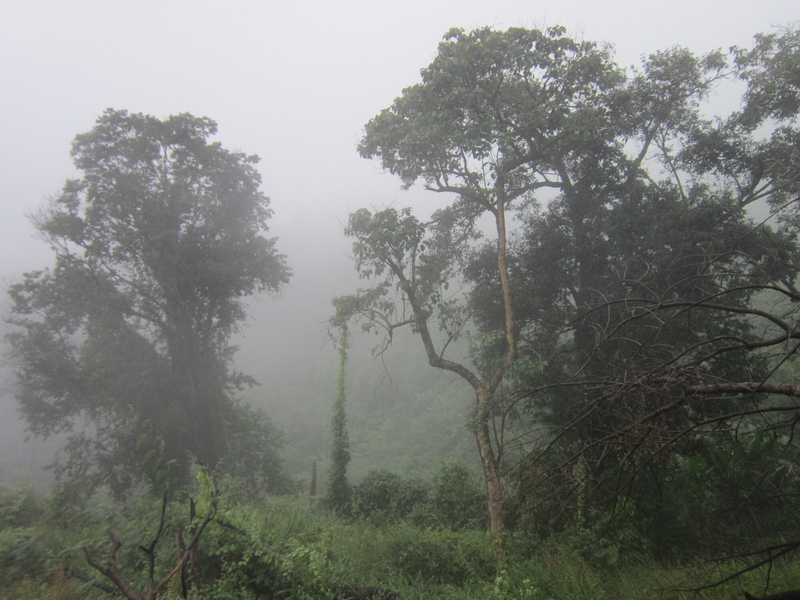 Of course it had been absolutely pelting down with rain in the night and continued to do so the entire day so the return to Muang Ngoi was a tough soggy haul, with a lot of slipping over! It did spoil the view somewhat but it was kinda cool seeing so much mist and clouds at the top of the mountains. 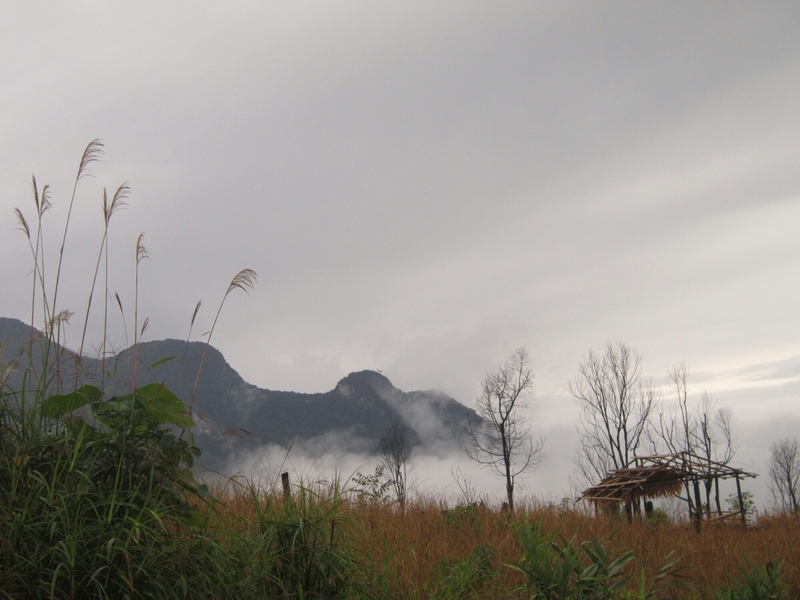 Anyhow we made it back to Muang Ngoi where we stayed the night and got warm and dry. The next day catching the boat back to Nong Khiaw was upsetting as a guy I’d met in Pai was on it and clearly had dengue fever (since confirmed by another Henry through the travel grapevine) and was heading to hospital with his girlfriend. Hopefully they will be ok and it would be nice to see them again under happier circumstances. After some slight indecision I headed back to Luang Prabang and an expensive private room to get everything clean. Glad I did because I was getting irritable after the soggyness from the trek and it sorted me right out, mood vastly improved! We 7 Henrys went for food then me and Michelle went to Utopia and got smashed on the Beer Lao which was fun! Most of the Henrys then headed the next day to Vang Vieng. Me Ally and Chris all stayed in Luang Prabang and got some nice food in the evening (went for pizza, it was great). We said farewell to Chris as he’s heading elsewhere. Then it was my turn to head Vang Vieng! Including one of those funny travel moments where on the bus there our driver stopped in the middle of the road so he go for a loo break and we all got out and when I looked up to see a bus driving past with Ally waving out the window! Great timing.